Darwin Building Lecture Theatre, Thursday 19th of March 1800 – 2100. Sausages in a bun from Cut-Me-Own-Throat-Dibbler will be available at cut-throat prices! We will be asking for charitable donations and all proceeds will go to Alzheimer’s Research UK. 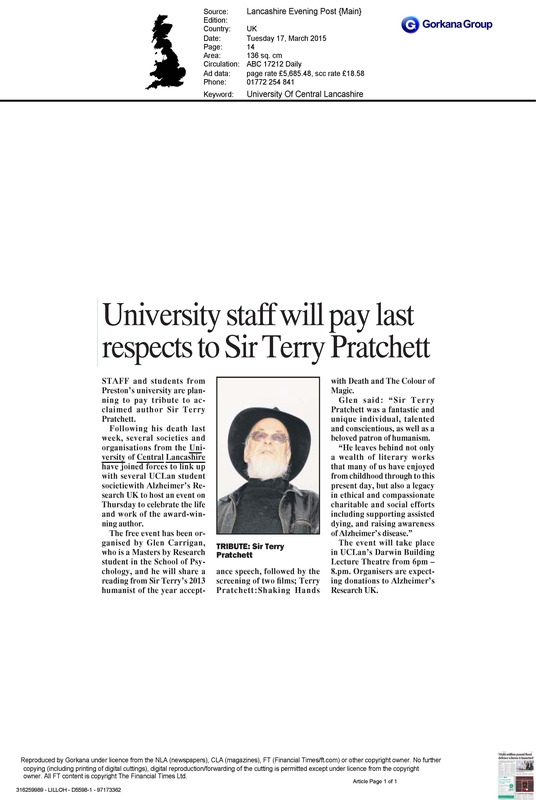 Sir Terry Pratchett was a fantastic and unique individual, talented and conscientious, as well as a beloved patron of humanism. He leaves behind not only a wealth of literary works that many of us have enjoyed from childhood through to this present day, but also a legacy in ethical and compassionate charitable and social efforts including: supporting assisted dying, and raising awareness of Alzheimer’s disease. 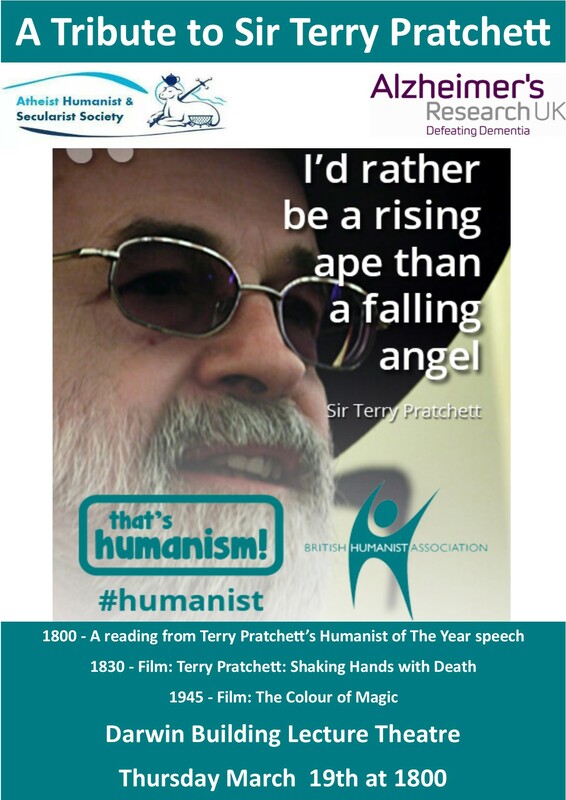 This event will celebrate the life and work of Sir Terry Pratchett as we hope he would have wanted it, with humour, reflection and a feeling of only slight embuggerance. This year the AHS societies from all the around the UK joined in non-prophet week to raise money for the Uganda Humanist Schools Trust. This charitable endeavour aims to allow pupils to get the most out of their education and in total raised £2,374 for the Humanist Schools Trust! We would like to say thank you to everyone that took part, including our fantastic volunteers, and all those who donated, because your generosity has helped hundreds on children to receive a better education. Non – Prophet Week is a week where irreligious people, in whatever form, unite to raise money for a charitable cause. In some years people have planted trees, donated blood and collected clothes to give to a charity shop as alternatives to or alongside fundraising. Fundraising is this years preference, as planting a tree, whilst good for the environment, is little use to a school in Uganda. You can read an article from the AHS Secretary, where he argues that “Non-Prophet Week is the very active part of humanism“ . You can get involved and share ideas on Twitter via the hash-tag #nonprophetweek. The AHS’ Social Media and Marketing Officer, Cloe Ansari, will be tweeting some of your ideas and helping to publicize what you guys do throughout the week! WHAT IS THE CHOSEN CHARITY? This year the AHS has chosen the Uganda Humanist Schools Trust. We will be raising money for a specific project or two that the charity urgently needs funding for, which will allow the pupils to get the most out of their education. Selecting the Uganda Humanist Schools Trust as our charity this year means we can all be sure that we are making an active and practical difference. It allows us to give the greatest gift of all: a better education. Virgin Money Giving is similar to JustGiving, but much cheaper for charities. JustGiving is for-profit and takes 5%, VMG is not-for-profit and takes 2% which is of course, of greater benefit to all involved. If we hit our target we drop a bucket of ICED SPAGHETTI on AHSUCLan’s Chair! See The National Federation of Atheist, Humanist, and Secularist Student Societies for more details.